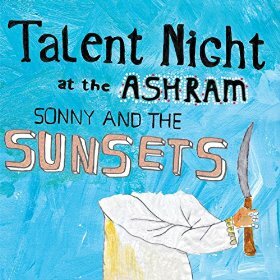 Sonny and the Sunsets’ new album, Talent Night at the Ashram, sounds something like underground pop surf rock hits of the 1960’s played on vinyl at the wrong speed. I like the group, but find the songs uncomfortable to listen to without covering myself in a blanket fort filled with glossy travel magazines. The album is like a collection of cinematic, low-fi, garage rock songs from yellowed film montages with just enough closure, but which leave the primary characters lost and unfulfilled. Ultimately, I think this album probably pairs great with some kind of drug that I’ve never heard of, but hipsters with old-timey hats in Los Angeles love. The album has some good and redeeming music such as “Secret Plot,” my favorite track off the album, along with the title track. Both songs blend great melodies with a slightly off-tilt feel that singer Sonny Smith specializes in and the songwriting is interesting as always. The album was originally designed as a film project, which later evolved into an album so the cinematic nature of the music makes sense and the first single “Cheap Extensions” was released with an appropriately lo-fi animation from Teppei Ando. The album will have an early-bird, limited edition run for vinyl-lovers pressed on 180g light blue vinyl along with the standard issue.